Morgan Eames of Doncaster Knights charges towards the Bristol line in the B & I Cup. But this was a game Knights could, and probably should, have won. Two of Bristol’s tries came from interceptions while a third came from a controversial turnover just inside the Doncaster half. Knights’ failure to win a series of their own lineouts in the Bristol 22 in the final quarter when the visitors had players in the sin-bin also proved costly. 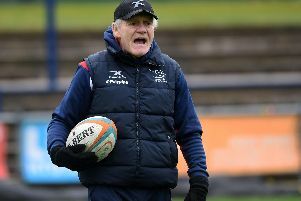 But as in the league defeat at home to Yorkshire Carnegie last time out, there were far more positives than negatives for Knights – not least the form of full-back Paul Jarvis. Bristol opened the scoring after just seven minutes. Second-rower Joe Batley will hardly have fancied his chances of going all the way when latching on to Tom James’ flat pass on his own 22 but that’s what he did to claim a converted try he will long remember. Bristol increased their lead to 10-0 with a Callum Sheedy penalty. Knights responded when No 8 Jason Hill created the position from which full-back Paul Jarvis, who had linked up out wide on the blindside, ran on to a floated pass by Cusack to touch down in the corner. Flanker Will Haining also showed good pace for a forward when backing up a break by scum-half Andy Uren and holding off the cover. Prop Joe Sprotson forced his way over from close range to claim Doncaster’s second try. Irrespective of whether the score should have stood, former England wing Tom Varndell showed his class when bagging a long-range try in the corner. The last try of the half scored by the creative Cusack was arguably the best. Jarvis, debutant Lesley Klim and James all featuring in the move. Bristol centre Jack Tovey took advantage of a mix-up between Clark and Cusack, to add another converted try on 46 minutes. Cusack cut the deficit to five points with a 49th minute penalty. Cusack’s delayed pass gave centre Klim the chance to beat full-back Ryan Edwards in a one-on-one . The conversion put Knights in front for the first time at 29-27. Knights suffered a double blow when Sprotson was sin-binned and Sheedy kicked the resulting penalty. Varndell intercepted a pass by Clark 40 metres out to claim his second try on the hour to make it 35-29. Knights, who had to settle for a Michael Heaney penalty, dominated the final quarter with both Tyson Lewis and Curtis Wilson going close out wide and Jack Ram being held over the line. Replacement fly-half Charlie Foley looked all set to level the scores following a good break only to have the ball knocked out of his hands in the act of scoring. Knights: Jarvis, Wilson, Klim, Clark, Lewis, Cusack, James; Bergmanas, Hunter, Sprotson, Eames, Hicks, Ram, Hills, Hill. Replacements: Nelson, List, Williams, Batt, Shaw, Heaney, Foley.